Wildfires are starting to break out in British Columbia, Canada. The wildfire on the image below started on May 1, 2016 (hat tip to Hubert Bułgajewski‎). The coordinates of the wildfire are in the bottom left corner of above map. 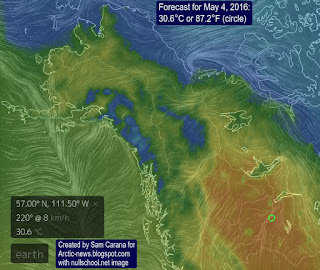 They show a location where, on May 3, 2016, it was 26.0°C (or 78.8°F). At a nearby location, it was 27.6°C (or 81.8°F) on May 3, 2016. Both locations are indicated on the map on the right. These locations are on the path followed by the Mackenzie River, which ends up in the Arctic Ocean. Wildfires aggravate heat waves as they blacken the soil with soot. As the Mackenzie River heats up, it will bring warmer water into the Arctic Ocean where this will speed up melting of the sea ice. Moreover, winds can carry soot high up into the Arctic, where it can settle on the sea ice and darken the surface, which will make that more sunlight gets absorbed, rather than reflected back into space as before. The danger of wildfires increases as temperatures rise. 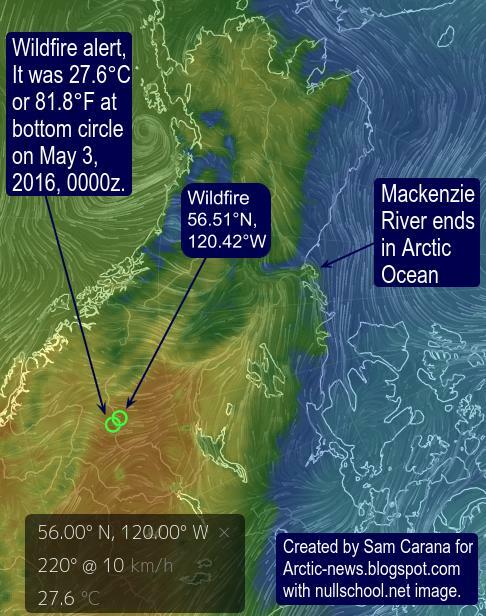 The image on the right show that temperatures in this area on May 3, 2016 (00:00 UTC) were at the top end of the scale, i.e. 20°C or 36°F warmer than 1979-2000 temperatures. Extreme weather is becoming increasingly common, as changes are taking place to the jet stream. As the Arctic warms up more rapidly than the rest of the world, the temperature difference between the Equator and the North Pole decreases, which in turn weakens the speed at which the north polar jet stream circumnavigates the globe. 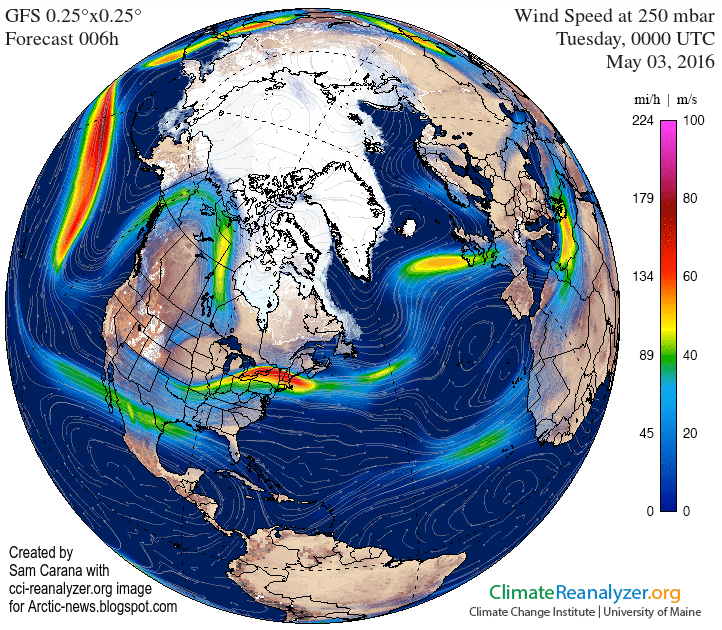 This is illustrated by the wavy patterns of the jet stream in the image on the right, showing the situation on May 3, 2016 (00:00 UTC), with a loop bringing warm air high up into North America and into the Arctic. Warm air makes the ice melt directly. 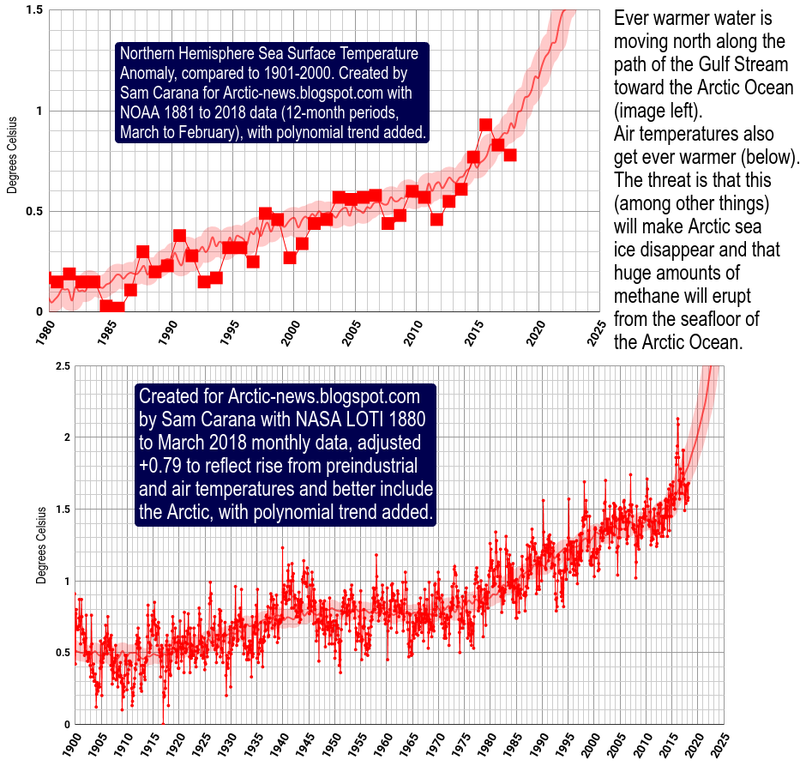 Warmer water in rivers warms up the Arctic Ocean. Wildfires blacken land and sea ice, causing more sunlight to be absorbed, rather than reflected back into space as before. The situation doesn't appear to be improving soon, as illustrated by the image on the right. 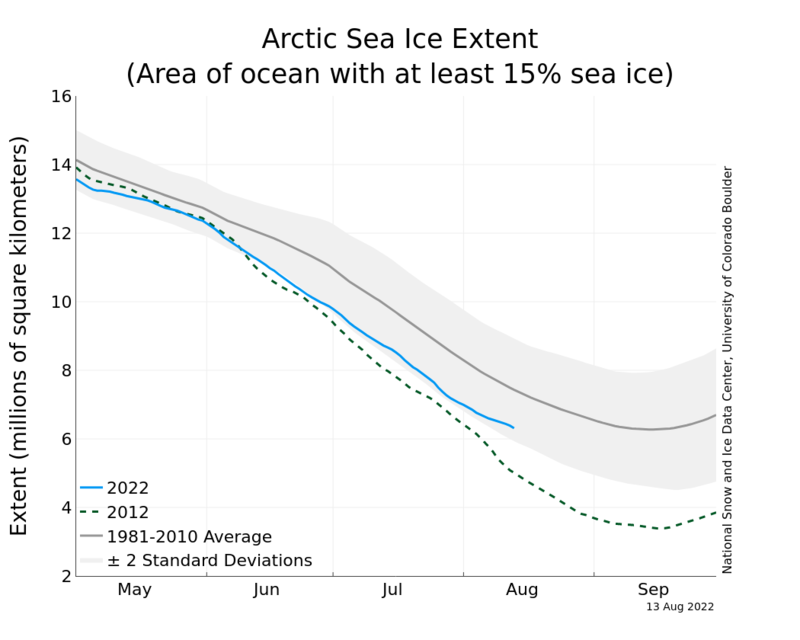 Following the record high temperatures that hit the world earlier this year, the outlook for the sea ice looks bleak. 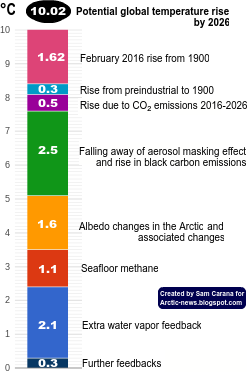 Further decline of the snow and ice cover in the Arctic looks set to make a number of feedbacks kick in stronger, with methane releases from the seafloor of the Arctic Ocean looming as a huge danger. Below is a comparison of temperatures and emissions for the two locations discussed above. Such fires are becoming increasingly common as temperatures rise, and they can cause release of huge amounts of carbon dioxide, carbon monoxide, methane, sulfur dioxide, soot, etc. May 3, 2016, at a location north of Fort St John, British Columbia, Canada. May 4, 2016, near Fort McMurray, Alberta, Canada. The video below shows methane levels (in parts per billion or ppb) on May 3, 2016, pm, starting at 44,690 ft or 13,621 m and coming down to 5,095 ft or 1,553 m altitude. In magenta-colored areas, methane is above 1950 ppb. In the video below, Paul Beckwith discusses the situation. Wildfires are also devastating other parts of the Earth. 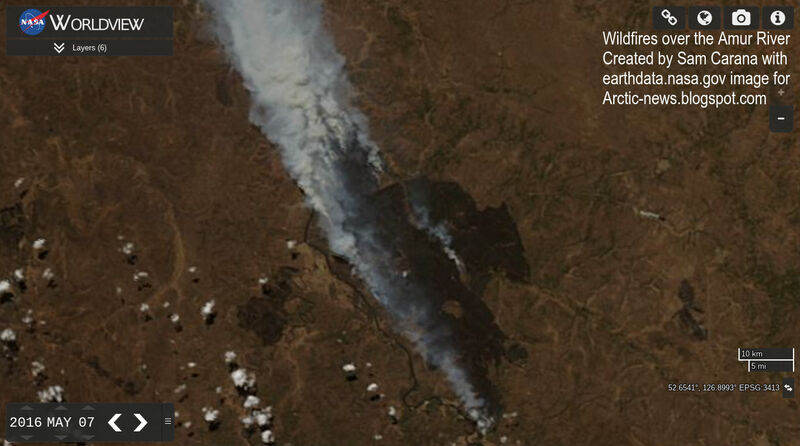 Below is an image showing wildfires over the Amur River on May 7, 2016. 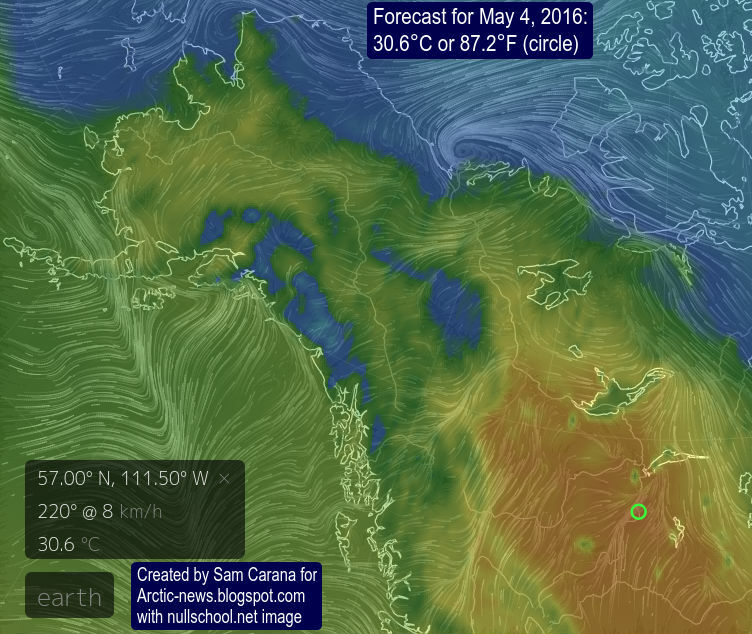 The image below shows carbon monoxide levels over the Amur River as high as 22,480 ppb on May 9, 2016. Hat tip to Grofu Antoniu for pointing at the CO levels. According to this Sputniknews report, a state of emergency was declared in the Amur Region as fires stretched across 12,200 acres. 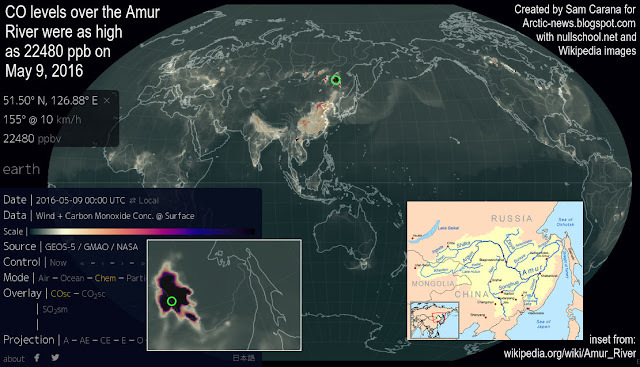 The video below shows carbon monoxide emissions in eastern Asia from May 1 to May 26, 2016. 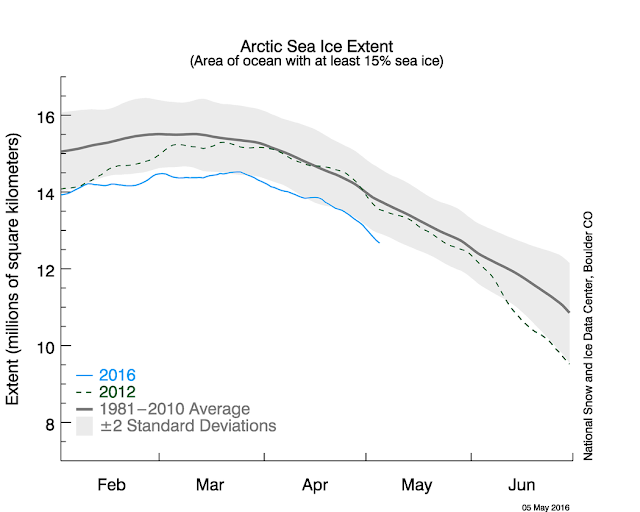 Meanwhile, the National Snow and Ice Data Center (NSIDC) has resumed daily sea ice extent updates with provisional data. The image below is dated May 5, 2016, check here for updates. As illustrated by the image below, from JAXA, sea ice extent on May 6, 2016, was under 12 million square km, more than 15 days ahead on extent in the year 2012, which was 12 million square km on May 21, 2012. Most natural processes on the Earth are run by convection including plate tectonics that moves the continental and oceanic plates across the surface of the planet. Mother Earth has been able to hold its atmospheric temperature within certain limits and maintain an ocean for more than 3 billion years because each time there was a build up of carbon dioxide in the atmosphere which produced a global fever, Mother Earth it eliminated the living creatures with a massive Arctic methane firestorm that fried them alive. This giant Arctic methane firestorm is a natural antibiotic the Earth uses to rid itself of those creatures that have overproduced carbon dioxide and caused a global fever. Essentially mankind has again caused a massive build up of fossil fuel carbon dioxide in the atmosphere and Mother Earth has already started to respond with the predicted massive Arctic methane blow out (since 2010) which will lead to an Earth engulfing firestorm in 5 to 8 years. The giant fires in the Fort McMurray region are a result of atmospheric methane induced heating of the Arctic and 93.5% global warming of the oceans that has generated a massive El Nino event this year. 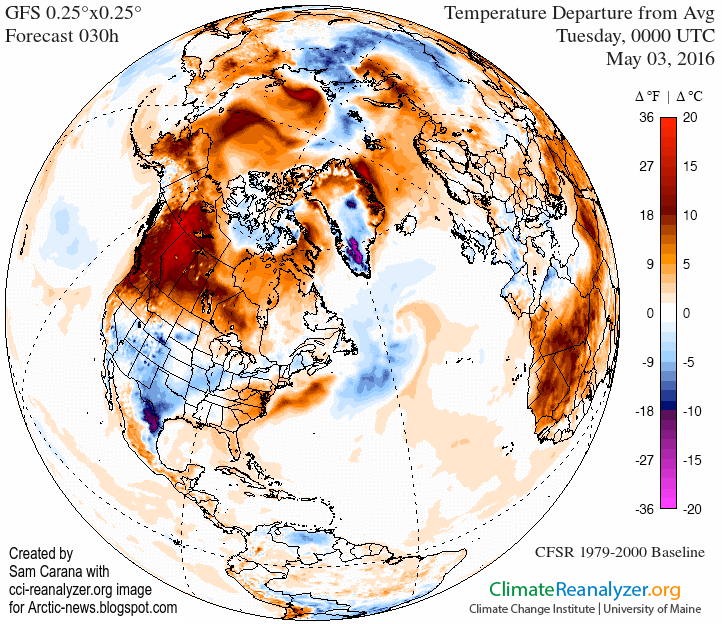 Hot winds moving away from these high pressure areas have generated high temperatures and massive fires in Alberta which is a giant fever spot on Earth where mankind has produced the maximum amount of dirty fossil fuel extraction and pollution in Canada. Mother Earth will continue to respond more vigorously with her Arctic methane antibiotic to eliminate the humans from her system as we represent nothing more to her than a larger version of an influenza virus which has seriously retarded her oceanic and atmospheric temperature range functioning systems. If we do not immediately stop fossil fuel extraction worldwide and control the Arctic methane emission sites we will all be stardust before a decade is past. The location of the high heat anomaly in Western Canada shown above is in proximity to high methane concentration cloud depicted in the map of light absorption of that molecule specie's sensitivity and done by crude method. If Merlin type full column observatory was flying people would react brave if given pathway Real so work naturally tended in value to remedy. The home of the Oil Sands is on fire, it's consuming the city of Fort Mc Murray at incredible pace. Temperatures in Fort Mac are 30C, way above normal. The fire threatens to burn most of the city, while the oil producers say that this fire will cause a decline in production because the work force will not be available! Poor them, never mind the workers. More than 20,000 people have gone south to the city of Edmonton , while the rest , 60,000 or so, are going in different directions to find refuge. Alberta declared state of emergency. But above all, this is happening to a province where most people do not "believe" in climate science, they reduce this to a fight for jobs vs the greens who believe in conspiracy theories. This is a wake up call to Canada and all provinces, that science was right, that something must be done, now. I doubt they will do anything as usual, all talk, no action. We will burn, am ready. Sad indeed, but we should prepare in every corner of earth as best possible for the decline of everything. When we hear that "it could be as bad as 2012", shouldn't that be it is very likely to be worse by a significant margin than 2012. 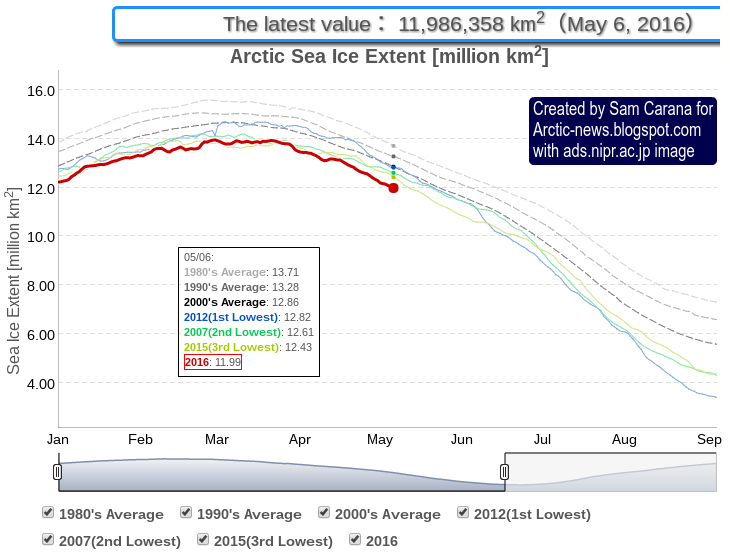 Even just normal losses from now until September give an estimated minimum area of a little over 2 million sq km. Given the significant extra heat over Canada heating the rivers Hot waters in the Pacific flowing in, then add soot from the fires, a sub 1 million sq km must be at least possible. I can understand the optimism as it is a natural evocation, however, the people who could have impacted this issue when it could have been thwarted, chose otherwise. Even now, while visible effects are apparent, it remains business as usual. Sadly, this is fate, mankind acts as an virus on the planet and it seems the earth is no longer interested in being sick. I thought Australia had bad bushfires. But I dont believe we have ever evacuated 80,000 people at a time. This is something else again. California's fires last year were a quantum again beyond ours. If Malcolm Light is correct then there is nothing that can be done. This topis is as fascinating as it is macabre. You were spot on in covering the increased wild fire risk, before the big one broke out in Fort McMurray Alberta! Here is my initial response to the Fort McMurray fires on You tube: namely, what did they think was going to happen? When you mine the most carbon-polluting source of oil, the climate gets unstable, and bad things happen. The oil industry itself is not immune. How Much Warming Have Humans Caused? Arctic Sea Ice gone by September 2016?